8)Sunday ,5;30 AM we head out fishing. The Boy is driving his truck and pulling my boat, no wind. We had looked on the computer and decided that Bynum Reservoir would be the destination. Even though the forecast said NO wind don't believe it for Bynum. I think all hurricanes use it for some kind of training ground so when they grow up they know what there supposed to do, anyway. The wind was manageable, just a nuisance first from the west then from the east. For the most part it was a very nice day. The lake is still very low the deepest spot we found was 23' right off the face of the dam. A huge flat 10 to 13 feet and then there is the Island, didn't know there was an island, No problem but you can see it under the water and its only 2 feet of water over the top and it's BIG. We fished the dam for two hours and slammed the perch and Daughter-in-law got a BIG rainbow, spanner full of eggs. There was four sets of campers there when we got there but no boats, by the time we left probably 25 boats and 50 or so bank fisherman. The shore fisherman where fly fishing for the big spawning slimers. Most the boats took off and headed across the lake, They all went around the island. 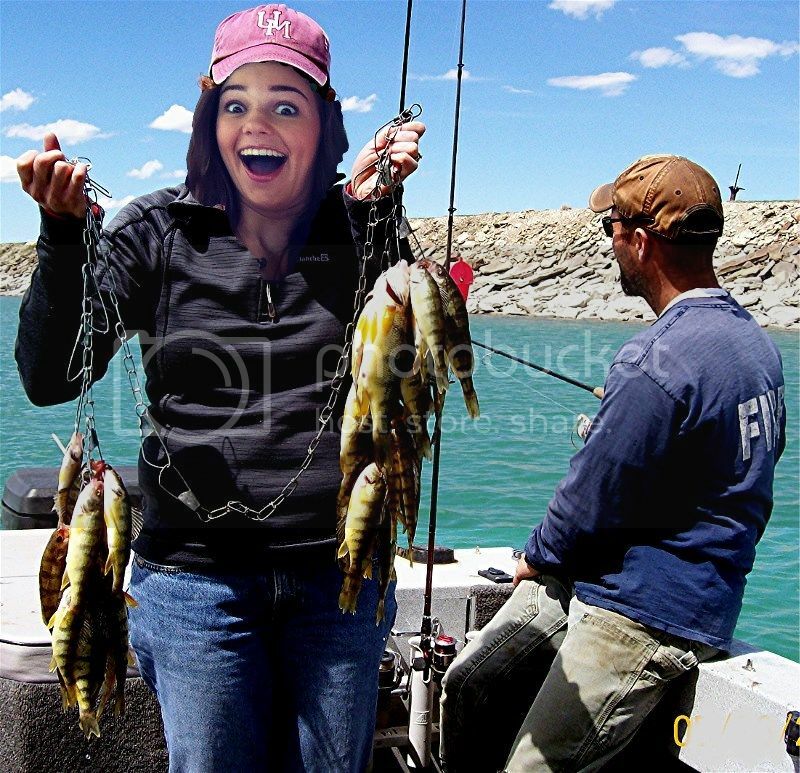 We went over to see if the fishing was any different, Nope just a bunch of Perch if you fished the deepest spots. We had to fish on the bottom and jig hard with a small white and green tube body and a peace of worm. Every one seamed to be getting a ton of perch. When we where fishing We noticed a 19 foot bay liner that was having motor problems. They would get it started run a hundred yards and it would stall and they would try again, and again. You know you would think when the got it running they would head back to the ramp, not. Any way with the east wind they just kept getting closer to the wrong shore... You ever see anyone try to use plastic fold up emergency paddles? STUPED !!!! That's why I don't even carry any, I have two long handle shovels at least you can use them, anyway. We had to go and save them, by then they where in one foot of water and we where trapped behind the sunken island. We pull up and one of them stand up on the boat with a five foot yellow plastic rope and ask if we could pull them back. Kristopher and I could tell they wouldn't have anything to help and had gotten our good rope set and just tossed it to them .BOY a 19 foot fiberglass bay liner and 4 big guys pulls hard agents a 15 mph east wind. I couldn't hit the gas to hard or I'd vacuum the bottom with the intake never a good thing. Twenty five long minuets and we had them back ,I gave them a GOOD tug and I flipped my boat away from the bank and we let go of the rope. They drifted right in. We have a fender float on the end of the rope so they tossed it back at us and we picked it up and went back to our first spot and finished fishing there. At the end of the day we had kept 47 eatable perch . We did PERFICT boat trailering and left just in front of all the other boats and missing the thunder storm by 10 minuets. Ha Ha Ha. Just a nice trip, I didn't any Gopro footage and only one picture sorry, to busy fishing I guess. That boatload of nitwits you helped were fortunate you happened along and helped, D.
Y'all did pretty good, considering all the delay and weather. Nice bunch of perch and picture!